Residents at a Dorset beauty spot say the closure of a council-run toilet has led to members of the public urinating in the street and people's gardens. 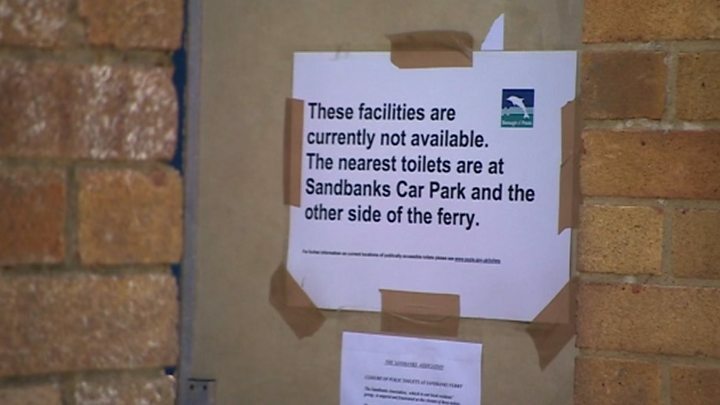 Sandbanks Association said it was "angered and frustrated" by the closure of the lavatories near the chain ferry. The nearby Haven Cafe has been forced to install a gate to its yard to prevent people relieving themselves. Borough of Poole council said visitors had "plenty of opportunity" to use a toilet before arriving at the ferry. Councillor John Rampton, who has received emails of complaint from residents and visitors, said the nearest toilet was a 12-minute walk away, with another facility at the Studland ferry terminal. However, he said the council could look into providing signage, warning people about the closure which came into force last month. The council said it was involved in "active discussions" with a local business to take over the running of the conveniences. In a bid to save £75,000, the authority has closed half of its public toilets - leaving just 13 council-run facilities in the town, plus 21 community-run toilets. Zoe Lamble, of Haven Cafe - which are next to the closed facility, said: "I've seen people [urinating] in the bus stop across the road, we also saw people using the back of our shop before we put the gate up, and where the men's toilet door is there's a nice little secluded wall, so that's the favourite spot." People often have to queue for more than an hour to get to the ferry during the summer and expect there to be a public toilet, she said. She added the cafe was not able to offer its lavatory for public use as it is often occupied by customers. Ms Lamble urged the council to reopen the toilets particularly during school holidays and at weekends.